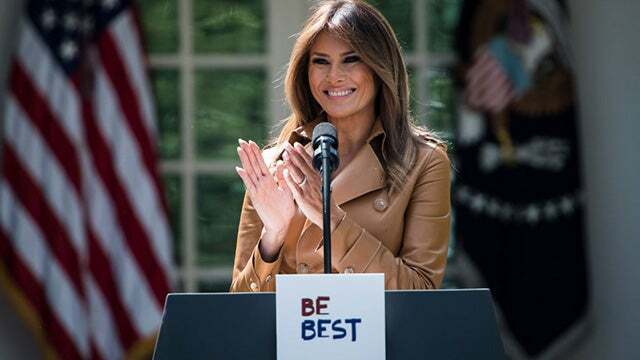 RUSH: We keep hearing from the Drive-By Media how Melania Trump cannot advocate for cyberbullying of children because her husband, Donald Trump, is a bully. This is an age-old leftist argument. “You can’t talk about the defense budget. You didn’t serve in Vietnam. What gives you the right!” Donald Trump is not a bully. Donald Trump is a counterpuncher. Donald Trump is a counterpuncher with adult political opponents, not children — although that could be debated. You could make the case that the Democrat Party today is made up of a bunch of children. Donald Trump hits back at the Drive-By Media and other opponents who are arrayed and stacked at negative 91% for two years! If anybody’s being bullied, it is Donald Trump! And he defends himself on a forum not filtered by the Drive-Bys. That would be Twitter. Say his wife cannot advocate this ’cause her husband’s a bully? Crock.